Superb handling! The Pflueger Cetina Low-Profile Baitcast Reel features a one-piece graphite frame; machined-, ported, and anodized aluminum spool; titanium guide line; quality 10-bearing system (9 doubled shielded stainless steel ball bearings plus one-way clutch instant anti-reverse bearing); patented 6-pin adjustable centrifugal brake system; thumb bar; smooth multi-disc main gear applied star drag. Weight: 7.8 oz. Drag power: 9 lbs. Line capacity: 12 lb./100 yards. Line recovery: 28'' per handle turn. Gear ratio: 7.1:1. "ive owned many 300 dollar reels and this $100 dollar reel is just as good, great for just about anything you can imagine you can do while fishing." "this is a very smooth reel great to use. great reel for the money it is the best i have found for the money. its pretty ease to set if your a just getting started just pop the cap off and and turn all the brakes on once you get used to it just start turning the brakes off two at a time it will cast far or flip great." 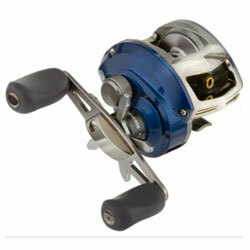 "I have allways been a Pflueger fan and I am glad they finnaly came out whith an afordable 7.1.1 real. "